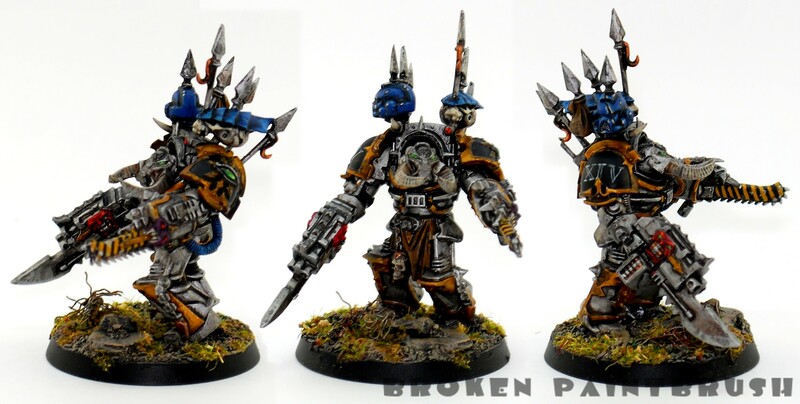 So as I continue to balance between completing old units and finishing new ones (see the Mentor Legion guys I just finished) I have put the finishing touches on my 4th Iron Warriors Terminator squad (WIP shots here). There wasn’t much left to finish on this squad. I finished the base using my new style and painted on the XIV to mark them as part of the 14th Grand Company. Standard bolter and power ax with the obligatory Space Marine helmet. Heavy flamer and power fist with the cool helmet from the Sorcerer Lord kit. Chainfist time and a trophy rack with my Brother-in-law’s Hive Fleet Behemoth head on display. Combi-flamer and another power ax. This is by far the coolest chainfist, fitting I also give him the combi-meltagun.